OXONIAN, An (1859) A Little Tour in Ireland. Illustrated London News, 19 Nov, 1864. Claddagh, Galway, by John Leech. A Little Tour in Ireland (1859). A Little Tour in Ireland, written under the pseudonym “Oxonian” (a member, or former member, of the University of Oxford), was first published in London in 1859. A reprint of 1892 names Samuel Reynolds Hole, Dean of Rochester and horticulturist, as the author. 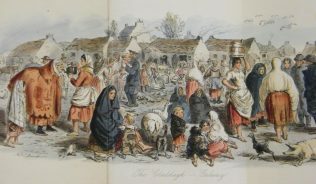 It is a travel account, illustrated by the renowned Victorian artist, John Leech, of a fortnight’s tour in Ireland undertaken in the summer of 1858. Leech (1817-1864), whose father hailed from Ireland, had shown artistic ability from a young age. In 1841 he began illustrating for the (in)famous Punch magazine. Two years later, he began a series of “cartoons”: full-page satirisations of the Westminster Hall murals; his title stuck and so effectively Leech gave to the English language the meaning of the word “cartoon” as a satirical print. However, he is perhaps best remembered for his illustrations of Charles Dickens’s classic A Christmas Carol (1843). The vibrant coloured illustration of the Claddagh featured here appeared as a fold-out section within A Little Tour in Ireland . 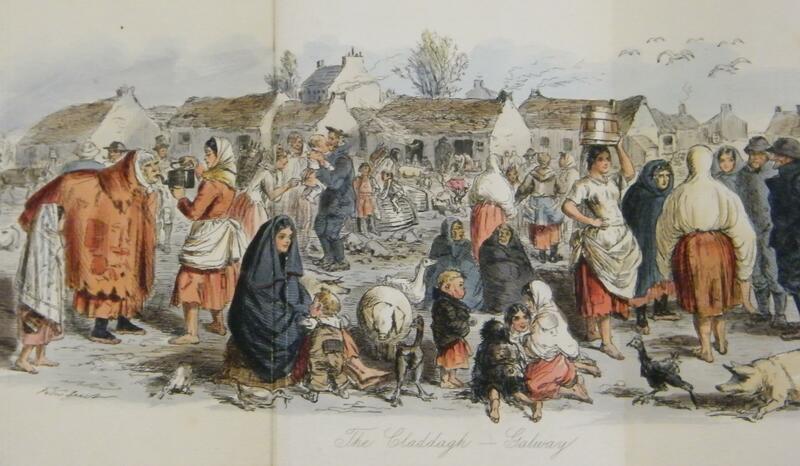 It depicts a lively scene of the local community set against the backdrop of the famous Claddagh cottages. Hole (1817-1904) graduated from Oxford University in 1844 and was ordained a priest the following year. Hole and Leech met in 1858, becoming close friends and hunting partners, and later that same year crossed the Irish Sea together to tour Ireland. As to the origin of these Claddagh people, I am not sufficiently “up” on ethnology, to state with analytical exactness the details of their descent; but I should imagine them to be one-third Irish, one-third Arabian, and the other Zingaro, or Spanish gypsy. I thought I recognised in one old lady an Ojibbeway chief, who frightened me a good deal in my childhood, but she had lost the expression of ferocity, and I was, perhaps, mistaken. The men are all fishermen (very clumsy ones, according to Miss Martineau, who talks about harpoons as if they were crochet needles, in her interesting “Letters from Ireland”); but they give up their cargoes to the women on landing, only stipulating that from the proceed they may be supplied with a good store of drink and tobacco, and so get due compensation on the shore for their unvarying sobriety at sea. 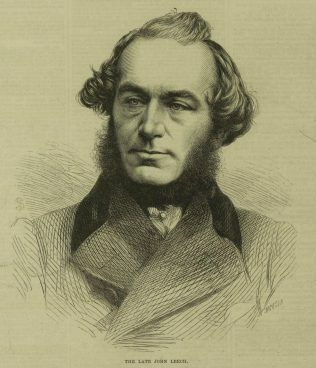 HOUFE, Simon (2004) ‘Leech, John (1817-1864)’. Oxford Dictionary of National Biography . Oxford: Oxford University Press [online edition]. NORGATE, G. Le G. (2004) ‘Hole, Samuel Reynolds (1819-1904)’. Oxford Dictionary of National Biography . Oxford: Oxford University Press [online edition]. OXONIAN, An (1859) A Little Tour in Ireland, being a visit to Dublin, Galway, Connamara, Athlone, Limerick, Killarney, Glengarriff, Cork, etc. with illustrations by John Leech. London: Bradbury & Evans. ..and during this time £67bl in todays money was repatriated to England from the East India Co in one year. Now lets say they had 10 years at £40bl pa average = £400bl and people in Ireland were living no better than rats in a sewer. The only middle class area was beteen Dublin and Wexford prior to 1921. The patronising tone from their visit is common in almost every account of an Englishman 99% negative with a spec here and there identifying uniqueness. A dreadful read and upsetting to absorb actually.